I hate packing, I am awful at it. I always bring tons of stuff that I don't need and live in fear that the custom dudes will open my bag and unleash an explosion of knickers. I tend to squidge things in, I am definitely not a folding type person, so a clothes explosion is a real possibility. Do I take tea with me? Do I declare the tea? Sod that, the tea is staying at home. Luckily I have plans to visit an 'Authentic' British Teashop whilst I am wandering, so can get some tea there. Not that the tea is even for me, wanted to gift some to my Anglophile American chums. My mind has gone already, lost the plot and it is all because of bloody tea. Wasn't there a war over this? I forgot to mention something else in my last post, I want to see some animals, of the American kind. Lions and Tigers are out, but there is a chance for bears, oh my! Also some Moose, unless the Moose are standing in the middle of the road and causing a near fatal collision, that would not be cool, bad moose. 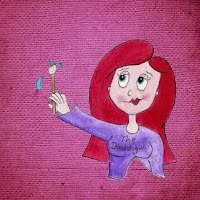 The Doodologist : My business FB page, in which I have some vague plans to do some travel doodling and hope to update you with them. It it's doodling, then it is related to the business. I am also doing a charity craft fair whilst I am over the yonder pond, so thought it would be cool to report on how that went. The Distracted Wanderer: Linda aka The Distracted Wanderer is my host for this travel odyssey and she takes many a great photo and writes many a word, so be sure to follow things via her book of faces, she is much more likely to post than I. @crpitt - No tweeting from me immediately until I get my hands on a weblike device, as the phone is staying at home. I will write some tweets in my doodle book, until I do so. @TDWTravelBlog - The twitter version of The Distracted Wanderer, who unlike me, has a smarter than smart phone. This one, as in this very weblog that you reading now, full of wiffle and some waffle, with maybe some added Moose! That one, as in The Distracted Wanderer, this is Linda's travel blog. I provide the fluff and daftness, with the occasional doodle, drivel and photograph, whilst Linda provides a historical insight into the places that she travels too, with lots of pictures. Is that enough social media? Shall we place bets on how many and how often I actually update any of the bloody things? don't worry about the social media - just enjoy your time here.